Out here in sunny California, people are always going out to the beach or the pool or the park. Not us though, we're inside blogging, just the way we like it. 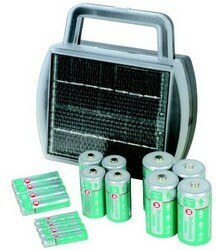 But even indoors, we can take advantage of this solar powered battery charger to fill up all our AA's. This charger charges four of the same type of battery at a time—AAA, AA, C or D—and finishes within 6 hours. Great for people on the go or the electricity conscious.